Interactive kiosks are an essential gateway for customers to have the best possible in-store experience and online reference and buying tools at their fingertips. Powered by technology partners such as Intel, Microsoft and others, your innovative touch-screen kiosk systems will create a connected multi-channel consumer experience, with content designed to drive shopper behavior toward targeted and timely product promotions; and bring branding to designated areas such as customer wait areas, store departments and in-aisle product promotions. Our advanced technology are at your disposal to offer exclusive information, advice on digital signage and self-service technology. TOSHIBA TEC Singapore has product certification meet to major trade organisations such as China, EU and US, as well as with accredited certification organisations such as TUV, UL, Energy Star and a host of other certifiers. Ask us for more information on our products’ accreditation in your regions. Explore our exciting portfolio of the newest digital signage and kiosk solutions together with our software partners. Our team is ready to work with you now to create an aesthetically appealing Kiosk Solution equipped with a durable and highly accurate multi-touch display. 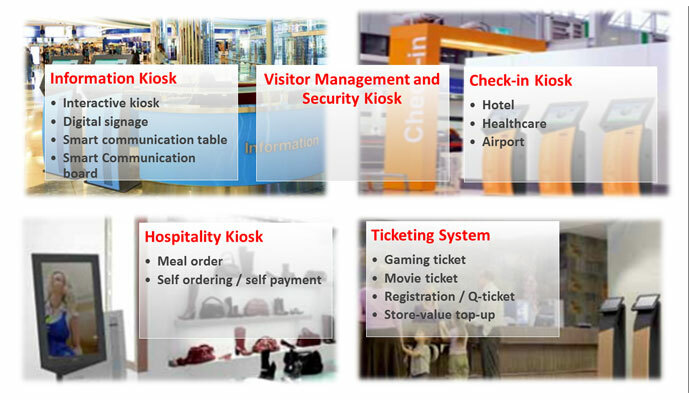 We are totally committed to fulfill your demand for the perfect interactive digital signage display and self-service system or stand alone kiosk solution. Custom-built self-service kiosk has always been at the heart of people’s attention when properly designed. The custom details, whether in styling, performance or electronics, go a long way in adding value to getting your messages across in the multi-channel world of communications with customers. Talk to us and learn how you can benefit from our long-standing experience.